The big news from Copenhagen this morning: U.S. Secretary of State Hillary Clinton’s announcement that transparency is absolutely necessary for any U.S. participation in financing a global climate change treaty. Saying the U.S. is “ready to do its part,” Clinton pledged that the U.S. would raise $100 billion a year by 2020 to help poor countries fight climate change — but ONLY if all countries agree to binding and verifiable emissions cuts. If there is not even a commitment to pursue transparency, that is a kind of deal breaker for us… In the absence of an operational agreement that meets the requirements that I outlined, there will not be that kind of financial commitment, at least from the United States. Transparency — knowing whether countries are living up to their commitments — is the linchpin of an effective global effort. The details of how we measure progress and hold countries accountable to their commitments can be worked out over the coming months. The single most critical goal here in Copenhagen is a commitment by all nations to address transparency … The outlines of an agreement are taking shape. But they could be erased if transparency is blocked or diluted. Assuming all countries do commit to transparency, Clinton says the $100 billion per year would come from a wide variety of sources, including the public and private sectors in the U.S. and other developed nations. You can watch Clinton’s entire news conference from Copenhagen. 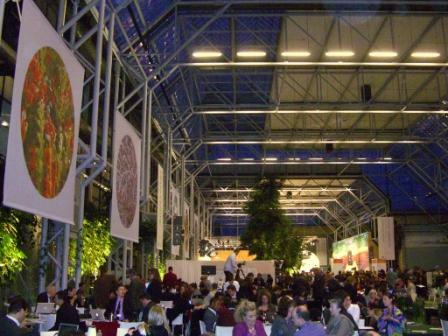 EDF has been at the climate talks in Denmark for more than a week now. We’ve learned a lot in that time – and not just about international climate policy. We’ve also learned a lot about the logistics and culture of the Bella Center – the conference center where the talks are taking place. But the Bella Center is now off limits for many conference participants. As of this morning, the UN is limiting entrance “for security reasons” to just 15,000 people, out of the 40,000+ people who signed up. Beer, wine, and consumers of both: the food stands in the conference center serve alcohol all day long, and – surprising to us Americans – you pour your own beer from the tap. 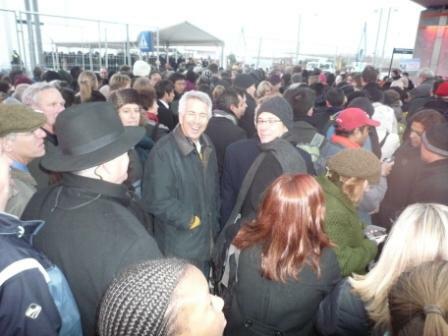 Large crowds and VERY tight security – the combination of which led to six-hour-plus lines for admission and the eventual 15,000-person cap on entrance to the conference center. The carolers dressed as elves, singing 12 Days of Christmas with climate-themed lyrics. Temperatures hovering around freezing, sunrise at 8:30 am and sunset at 3:30 pm. the FREE fair-trade dark chocolate squares: dangerously abundant and available at every food stand. Power strips: there’s brutal competition for places to plug in the computers, BlackBerries, cell phones, cameras, and other gadgets that are ubiquitous at the conference. People often stake out a table with its own outlet and squat there all day. The lust for electric outlets might seem odd for a bunch of energy-saving environmentalists, but on the plus side, we’re saving a lot of paper. Two new polls released today have some good news for the fight against climate change. A solid majority of Americans support the idea of a global treaty that would require the United States to reduce significantly greenhouse gas emissions. USA Today says the results should provide some encouragement for President Obama as he gets ready for his trip to Copenhagen. A separate Associated Press-Stanford University poll finds that most Americans think fighting climate change will be good for our economy. 46 percent say it would boost the economy. A sign the public is showing more faith in President Barack Obama’s economic arguments for limiting heat-trapping gases than in Republican claims that the actions would kill jobs. California Governor Arnold Schwarzenegger and regional leaders from around the world announced their plans to create of a new Club of 20 Regions (R20) last night in Copenhagen. The coalition, which is scheduled to officially launch in September, will highlight the vital role that “subnational” governments, such as states and provinces, play in fighting climate change. Schwarzenegger has been the pacesetter for the subnational movement since he signed the Global Warming Solutions Act (AB 32) three years ago. That groundbreaking legislation allowed the state of California to set a cap on global warming emissions – something that previously had only been talked about in terms of national policy. Action is needed at the national and international levels to reduce the effects of global warming, but California has shown that state and regional governments can also institute policies on their own that will see real environmental improvements and grow green jobs … R20 will help pave the way in the transition to a green economy. State and regional governments are laboratories for clean energy and sustainability solutions that play an important role in fighting global warming. California continues to be a key proving ground and has helped advance the critical issue of Reducing Emissions from Deforestation and Degradation (REDD) by partnering with Brazilian and Indonesian states in the Governor’s Climate and Forests Task Force (GCF). At a jam-packed event last night, moderated by EDF’s own Steve Schwartzman, several Brazilian Governors highlighted their state’s REDD plans and talked about the value of subnational collaboration in deploying innovative solutions to preserve forests. EDF thinks subnational actions make great environmental and economic sense, and help build momentum for national and international action. We look forward to watching R20 take off. Read more about the announcement in China Daily’s article. With the world’s largest tropical forest and a mostly hydro-powered economy, Brazil has been very busy with efforts to curb deforestation and use the resulting avoided emissions to fight climate change. In Copenhagen, with a modest bit of help from EDF, several top Brazilian officials put their commitment to forest protection and green growth on display. Brazil has become a global leader in curbing deforestation, developing mapping and monitoring systems to track forest cover, and creating legal systems to protect it. With a tropical forest half the size of the continental United States, officials know they need to be active players in climate talks -and most likely in emissions trading – to tap the resources they’ll need. Minister Carlos Minc told an audience of 250 people, two TV networks and a crowd of other journalists that Brazil will need public funds but also can’t snub market financing for REDD. While the governors were busy at the Mogens Dahl Center, three of the leading potential contenders for Brazil’s presidency swept into the Bella Center – putting to rest any doubts about whether a national commitment to reducing deforestation will outlast 2010 presidential elections. One possible presidential contender, Marina Silva, a rubber tapper from Brazil’s far west state of Acre and a former environment minster, has the other candidates striving mightily to establish their green credentials. Her approach seems to be working for the environment; industrial powerhouse Sao Paolo state has passed an emissions reduction law, and Brazil’s congress is looking at the possibility of an ambitious national emissions law. The Washington Post published a Q and A with Ms. Silva following her recent visit to Capitol Hill. The other likely presidential contender is Jose Serra, the governor of Sao Paulo. He’s expected to be the leading opposition candidate in Brazil’s 2010 presidential race. The third likely presidential candidate who’s here in Copenhagen is Dilma Rousseff of Brazil’s incumbent Workers’ Party. President Lula himself will arrive in Copenhagen later this week.